As I mentioned on Friday, this weekend was going to be another race weekend for me. And I was hoping for (pleading for, if you must know) more success than I had in Toledo. Race weekend opened with heading to the Pig expo where I stocked up on stuff I probably didn't need, but I am excited to have. Haha. I got another pair of shoes (I guess I will need those, just not right now, but for the price, you buy at expos!) J and I each got one of the Flying Pig "Porkopolis to Beantown" shirts with proceeds going to One Fund Boston. I got J some insoles for his shoes because he loved the ones that he got in Las Vegas so much. I got a present for Addie as well. He has wings. I want her to be proud of her city and her momma right off the bat and even though I didn't run the marathon this year, I will again. After that, I headed down to the river (at Great American Ballpark) to pick up the packets for J and I for the Little Kings Mile, which was the second race in the Beer Series. I gave away my drink tickets because hubby is not a fan of Little Kings Beer. So Randy and Brett got my tickets and I think they enjoyed them! I am glad to have so many running friends these days. It is super fun to see so many people I know at races now, especially when I used to feel so intimidated arriving at them. Now I like to roll in like I am the race queen! Haha. I know I am not fast, but it is good to be comfortable. J and I walked the mile to the start line (packet pick-up was at the finish line). They had buses and stuff, but we decided to walk up there, which I was glad about because it was a nice walk even though we went through a few sketchy parts. We also got to walk through the new revitalized sections of OTR where they have put in a lot of new restaurants and stuff, which is a blast. J and I definitely need to hit up some of the downtown scene, I think. J and I hanging out at Grammer's in OTR prior to the start of our 1 mile race! I was just going to run as fast as felt good in this race. I was in the second wave, and J was in the first. I knew that I was not going to be as fast as a lot of the other folks in my wave, but I felt like I could easily run a sub-9 for 1 mile without any issues. I ended up crossing the finish line in 8:06 (well, according to my phone). According to my phone it also was 1.03 miles, which averages out to a 7:51 pace. According to the actual results, I ran exactly 8 min pace. Either way, I am happy with my results. And J ran it in sub-10, which I know he is happy with. He must have been FLYING when he was running through because he said he walked two blocks! I am happy for him. I took this one because I am in love with this lower body outfit. 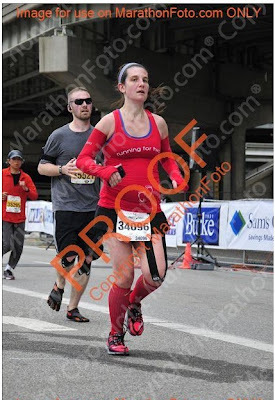 My Oiselle bum wrap (preggo skirt of choice as seen in last week's photo), some KT Tape (expertly applied to my sore quad by the rep, it is still there! ), hot pink pro compression socks, and my brooks pure flow 2 - my new fave shorter distance shoes! We enjoyed a little bit of time at the party afterward. Long enough for J to cash in his two drink tickets. He tried the special Cream Ale that Moerlein brewed for the 15th Anniversary of the Pig (modeled after an old Little Kings beer, which was appropriate, since this was the Little Kings Mile!). He was not a fan and only drank half before dumping it. I had a sip, it was ok. He had one other beer and we hit the road to go home since I was racing on Saturday as well. I got downtown pretty early on Saturday morning, even though my race was not until 10 am because they were closing down so many streets for the races. I got to see all of the 10K! It was kind of fun to play spectator for a little while, since I very rarely do! Eventually it was time to get rolling for my own race, so I left the Finish Swine to head over to the 5K start. Again, started a bit further back, knowing that I would not be going as fast as I might like to. The course was pretty good though. 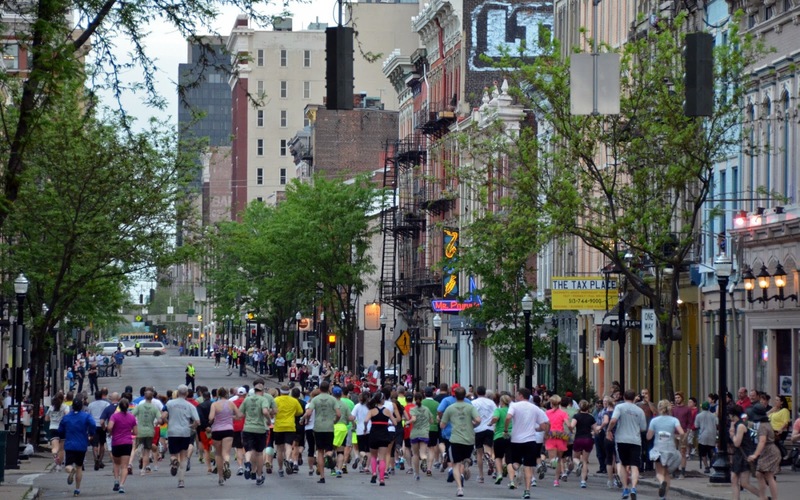 We did have some smallish hills to contend with, but it would not be running in downtown Cincinnati without them! Now, it was tough. I definitely admit that. 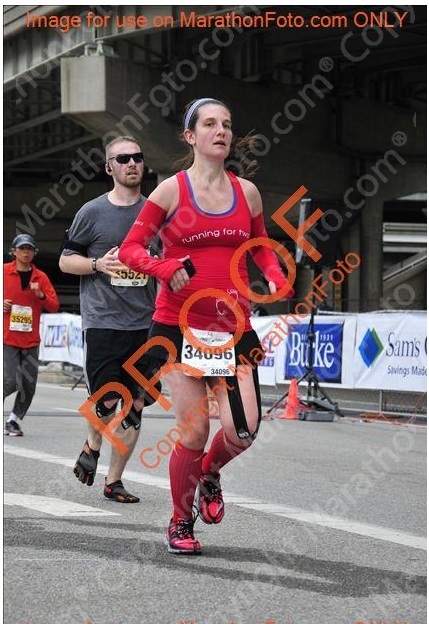 I was having a struggle to run like I might normally have around mile 11 or so of a hilly half marathon. However, I hammered out a good overall result. Umm top-25 for a HUGE age group without being able to run anything CLOSE to my best? I think you have to take that for what it is (a BIG OLE WIN!) and then you have to look at these chandeliers that were hanging out in the recovery area. I have never noticed them before (probably because during the Pig last year I was too excited about my finish to look around! Congrats to everyone who raced in the Pig or other races this weekend, I PROMISE I will be back with a vengeance before next year's Pig. No feeling sad because I can't compete then! Differing workouts and a TEST!